I am testing out a new to me feature on WordPress … the reblog… I think this is a perfect page to try it on…. Great for beginners. This class goes in depth in how to FMQ and how to get started. This class teaches many of the motifs found on the internet. She discusses how to prepare your fabric, your batting and putting this quilt as you go quilt together. 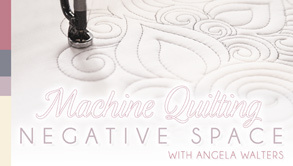 She also discusses trouble shooting problems that a new quilter may have when she FMQ. These classes reviews many of the motifs on her YOU Tube channel but into depth and with variations for many of the motifs. These classes are great for persons who have done FMQ and want to learn different motifs to get away from just meandering. The motifs can be used on traditional or modern quilts. Once you have learned the motifs they can be applied to as an all over design or block by block. I find the motifs very versatile. I recently realized I have talked about various Craftsy classes I have been taking in my podcast, but I have never written about them in my blog. Occasionally I would mention the class I was talking about in show notes but often as not there were no show notes. I always mean to write show notes but life gets in the way and I never get around to it once the podcast is posted. To rectify this I am going to write about the classes I have taken. I first ran into LEAH DAY on the internet / YOU tube. I had been trying to learn about FMQ (free motion quilting. ) 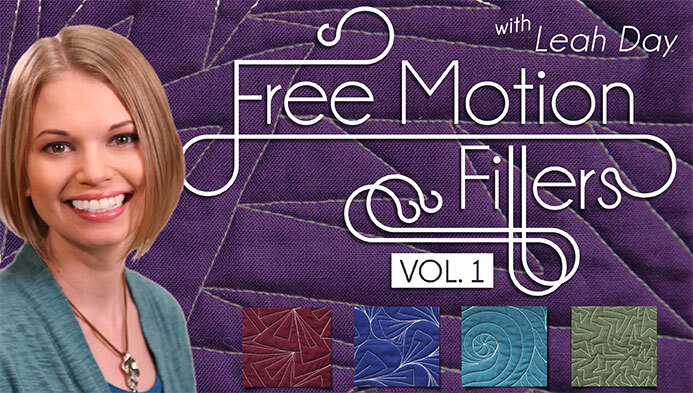 I put free motion quilting in to the search engine and Leah’s videos popped up. I was mesmerized. I started reading her blog and followed her in the now defunct Google Reader. When she signed up for being an instructor on Craftsy it was a natural class to take. Her classes are very much like her YOU tube channel but goes into greater depth. I had purchased LEAH’s first two DVDs from her web page, but I noticed she has not continued producing DVDs. All in all I found Leah’s classes to be enjoyable. She is a good teacher and went into depth on how to trouble shoot your FMQ if you develop problems. I always find that interesting as I do tend to have problems with my stitches. …. Less often now that I have been working on my FMQ for two years…. But when I started boy did I get myself into trouble. WHOOPS …. I lied she has a DVD I do not own and am getting soon … maybe for Christmas. I tend to buy myself presents cause then I get what I want and dear hubby gets kisses without having to go shopping… HE LOVES IT. Leah has a lot of products that help with FMQ, like the Supreme Slider, pin mores, etc. I recommend Leah’s classes, the SAMPLER class for rank beginners who have never done any FMQ before. The FMQ filler classes are more for someone who wishes to learn motifs and FMQ beyond meandering. I felt these classes was money well spent. I have reviewed them often. I also follow Leah on her blog and YOU TUBE channel. Regardless of what instructor or FMQ classes a person takes they need to realize they have to practice, practice, practice before they get good. If you do not practice and do FMQ consistently your skills will never progress. …. QUICK LINKS to past reviews …. Here are a few past reviews of books, classes and magazines…. GEE I thought I did a lot more reviews of CRAFTSY CLASSES, DVDs and books then what I have listed here. I think many of my reviews are in my podcast. So in the future I will be reviewing more….. especially the Craftsy Classes. I will be adding more quick links to this post as I find them in my blog .. so check back to this post. This is the blog post where I fond the motif inspiration. Angela Walters has been posting some examples of a cute leaf motif on her blog. I really like it and as you know I love LEAF motifs of any kind. So I tried to sew my own version of this motif. I was not comfortable doing unmarked FMQ so I marked the leaves using Roxanne chalk pencils. I had drawn out the motif over and over again on scrap paper to build my muscle memory of the pattern and to help me learn how to stitch out the motif. After working it for several days on paper I then tried to stitch it out. I had also stitched the pattern out in order practice the motif. I stitched it out nicely in practice. I am sorry to say my attempt on the quilt left a lot to be desired. I am seriously considering ripping it out and trying again. THIS post is a lost post that never got published…. Should have been a long time ago… better late than never. I enjoyed Ms Cameli’s class. I will say that this class is not for a rank beginner. She does not review how to get ready for FMQ. She does not show you to bring your bobbin thread to the top, or how to get your quilt top ready for quilting. She feels you had learned how to do the basics in the other Craftsy classes. She jumps right into doing her different motifs and doing FMQ on a domestic machine. If you have never done FMQ before then you need to take one of the other beginner classes. I recommend CINDY NEEDHAM DESIGN IT QUILT IT , LEAH DAY SAMPLER , Angela Walters ( she uses a long arm for several of her classes) and ANN PETERSON BEYOND BASIC MACHINE QUILTING. (Patsy Thompson’s and PAULA REID’s DVDs.) These ladies detail getting started and what you need to learn in the beginning of your FMQ adventures. I am sure there are several other instructors that detail basics of FMQ but these ladies are the first instructors I took classes from and I feel I learned the most from them. I will be reviewing their classes in the future. Ms Cameli’s classes concentrated on showing you how to FMQ a number of motifs and designs. 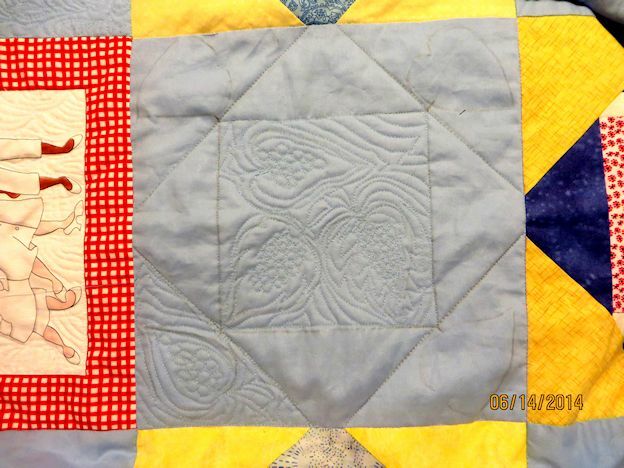 Several of her demonstrations were on larger quilt projects ( throw size or larger.) It was helpful to see how she wrestled with her quilt project especially when she demonstrates several all over motifs/ patterns. 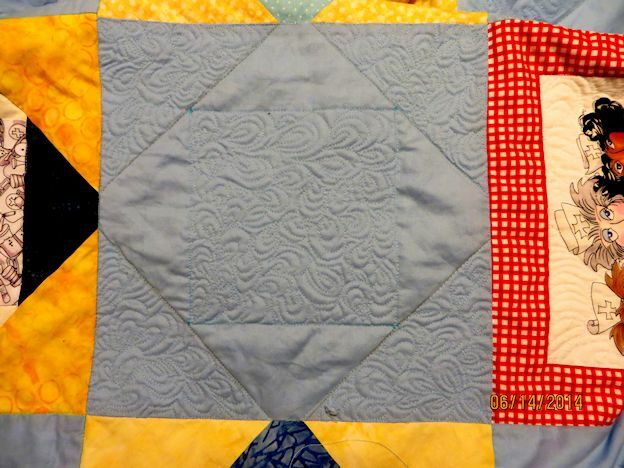 I liked how she showed ways of moving from one area of the quilt to another without breaking thread. Ms Cameli’s motifs are modern in style but can be applied to traditional quilts. Some of the motifs were taught in other classes I have taken. She has a different slant style to the FMQ so even though the motifs were similar her application was different. Her quilting motifs is less dense more open then what I have used in other classes. Many of them were suitable for all over quilting. I loved how she applied her motifs in her sampler projects. I was not disappointed with the motifs she demonstrated I thought they were different enough that the class added to my quilting skills. For each motif she show several variations that made the original motif look different. Each class was 20 to 30 minutes duration. She has group the motifs into similar styles and techniques used to do the FMQ…. Individualized one block motifs, top to bottom FMQ, all over designs. All in all, this was a worth while class which I enjoyed taking and can see I will be able to apply what I learn in the future. 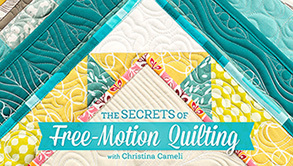 Ms Cameli is also an author and her first book FIRST STEPS TO FREE MOTION QUILTING lives in my library. She has a second book being released in a couple of months. In the first book she goes thru all the information you need to get started in FMQ. This is pretty much the information she did not cover in this class. She has sketches of a lot of motifs, the actual FMQ of many of these motifs are shown in close ups of projects in the book. She has included several modern projects where you can apply what you have learned. 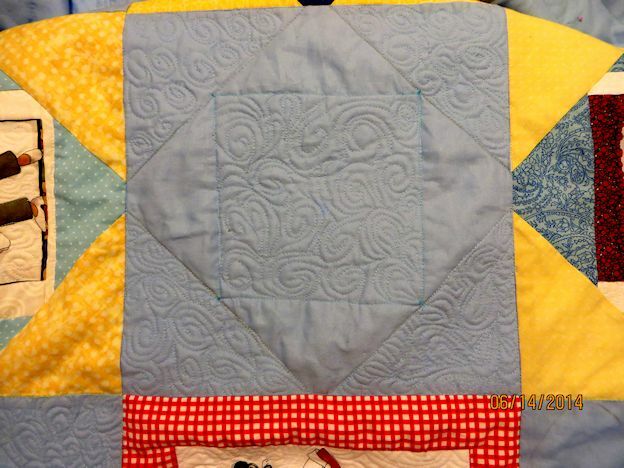 I liked several of her quilt projects especially the QUILT AS YOU GO QUILT where each block has different FMQ. On GOODREADS I would rate this book 3.5 to 4 stars/ 5. I would have liked more coordination of the FMQ sketches/ drawings and the photographs of the motif. There were a lot of photos and illustrations but the sketches were in another part of the book. It took me a while to find the sketch and cross reference it to the projects. I would also have liked to have seen more close ups of the FMQ.